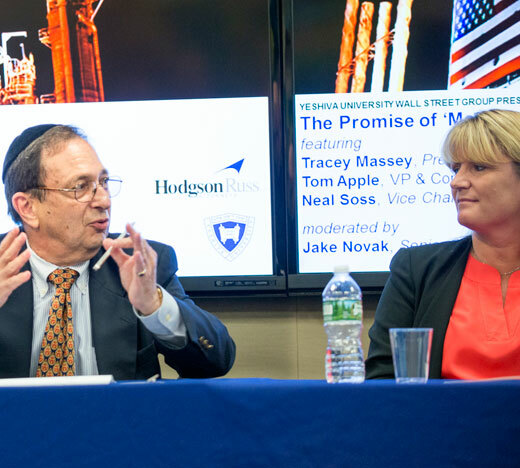 On Monday, June 19, the YU Wall Street Group hosted a panel discussion titled, “The Promise of ‘Made in America,’” concerning the role of manufacturing in the American economy. The event took place at Hodgson Russ LLP and was organized by the Office of Alumni Affairs. The panel, moderated by Jake Novak, senior columnist at CNBC.com, included Tracey Massey, president of Mars Chocolate, North America; Tom Apple, vice president and corporate counsel for ITOCHU International Inc.; and Neal Soss, vice chairman of research for Credit Suisse. Novak’s questions to the panel focused on six topics: the messaging from the Trump administration about reviving manufacturing; the state of the employment market; education; regulation and taxation; infrastructure; and decision-making about where to locate manufacturing plants. Overall, the panelists agreed that the U.S. manufacturing sector will never be restored to the level that President Trump desires. However, manufacturing continues to be a significant portion of the American gross domestic product, and the factors which constrain its growth have less to do with regulation and taxation and more to do with structural shifts in the global economy, especially the growing use of artificial intelligence (AI), robotics and other new technologies. Improving the possibilities for increased manufacturing in America depends on three factors not directly related to manufacturing but which have an enormous effect on its productivity. Third, improved manufacturing would restore some economic stability to certain labor sectors, like workers in rural economies and many other laborers left behind by economic changes. All four on the panel agreed that one thing that makes contemporary economic forecasting difficult is how the blurred boundaries between economic players have unexpected ripple effects. This trend of more and more enterprises not fitting into traditional molds will only continue. Novak thanked the panelists for their insights and invited them back for another discussion about what has changed and what has not. The Wall Street Group is one of many professional networks sponsored by the Office of Alumni Affairs. More information about these networks can be found at www.yuprofessionalnetworking.com. YU ALUMinate offers YU alumni the chance to post jobs, make professional connections and search for mentors at www.yualuminate.com.